"Last season I started in the Giro with that approach and I won a stage. I hope to be able to go for my chances in the Tour and who knows whether luck will be on my side." 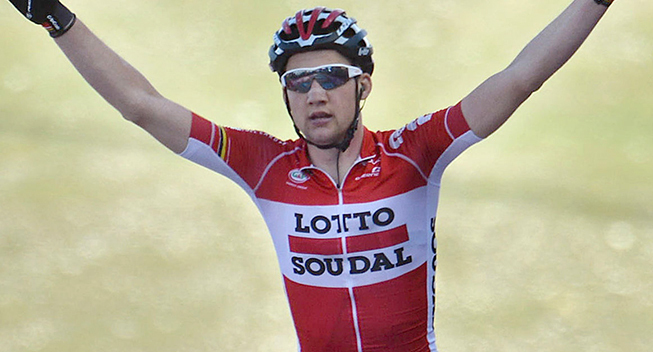 Tim Wellens is ambitious and wants to win a stage in the 2017 Tour de France. "I want to tackle the Tour like I did at the Giro last year: aiming for stage victories. The Gc is not a goal," the Belgian Lotto Soudal told Belga during the team presentation. Wellens season will begin in late January in Mallorca, but he will not be at his peak yet. "Next season I have to get into shape a bit later. Last year I was really good at the Challenge Mallorca in late January. That’s not good. It is better if I find the good condition later,” the 25-year-old said. “My first big goal this season is perhaps Tirreno-Adriatico and I will also do Strade Bianche and Milan-San Remo. Then it i the Walloon classics and then the Tour. My previous participation was not as I expected and I have learned lessons from that, also from the altitude training I had done beforehand. I don’t want to make the same mistakes. I really go to the Tour with full enthusiasm. It fits into my program and it is a course with opportunities for me," Wellens said. The natural question is whether he will go for GC.